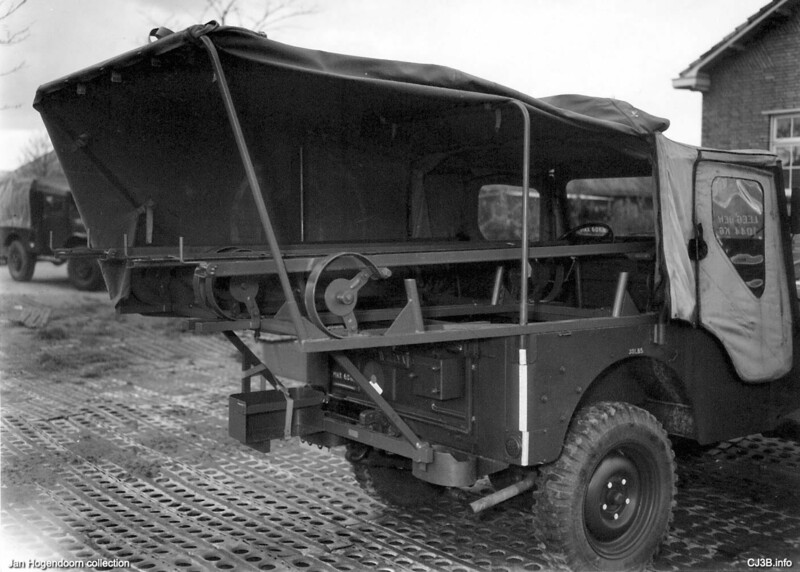 Following World War II, the Royal Netherlands Air Force (in Dutch, Koninklijke Luchtmacht or "KLu") received 38 MB/GPW jeeps from Canadian surplus stocks, and supplemented those by buying ten CJ-2A Willys Universal Jeeps in 1948. 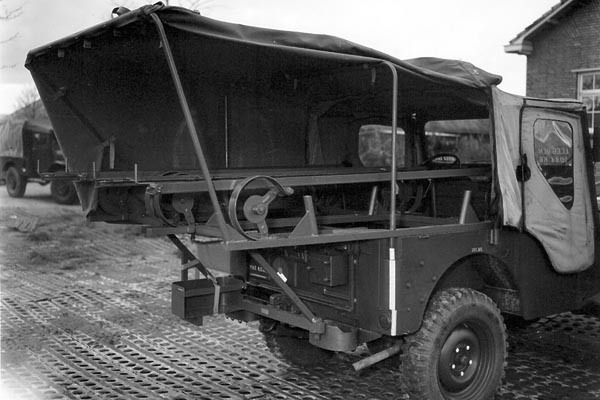 In the early 1950s the fleet was expanded with 80 surplus MB/GPWs from the U.S. Mutual Defense Assistance Program, and the purchase by KLu of 187 more Universal Jeeps, model CJ-3A. 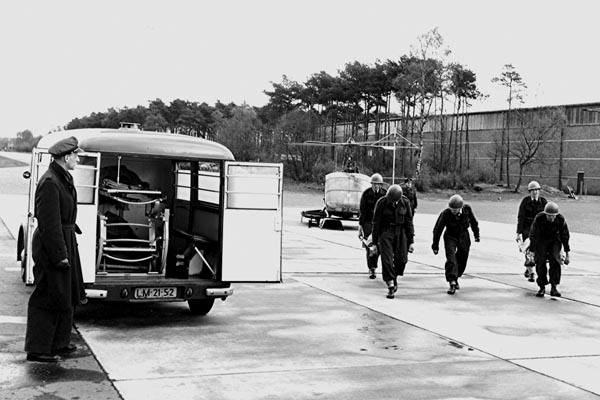 As well as personnel transport, the Jeeps were used for various runway duties. 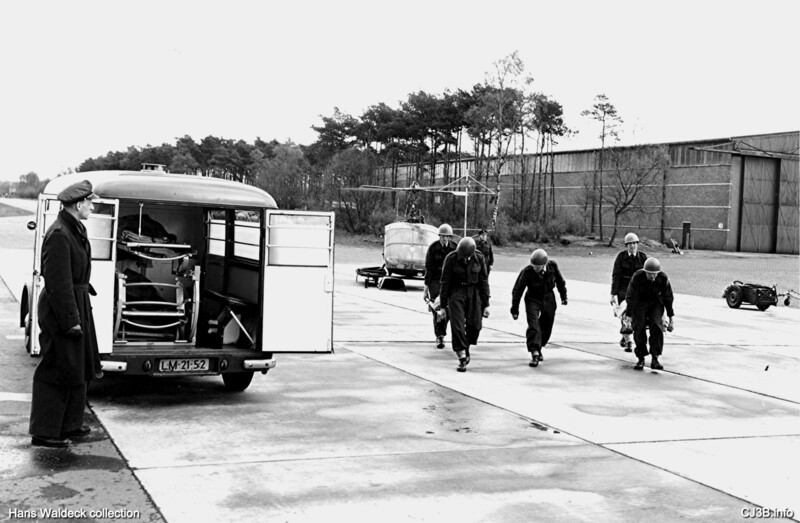 Some 57 were converted by KLu as fire engines and crash trucks (see CJ-3A Fire Service Conversions) and a few as ambulances (right). 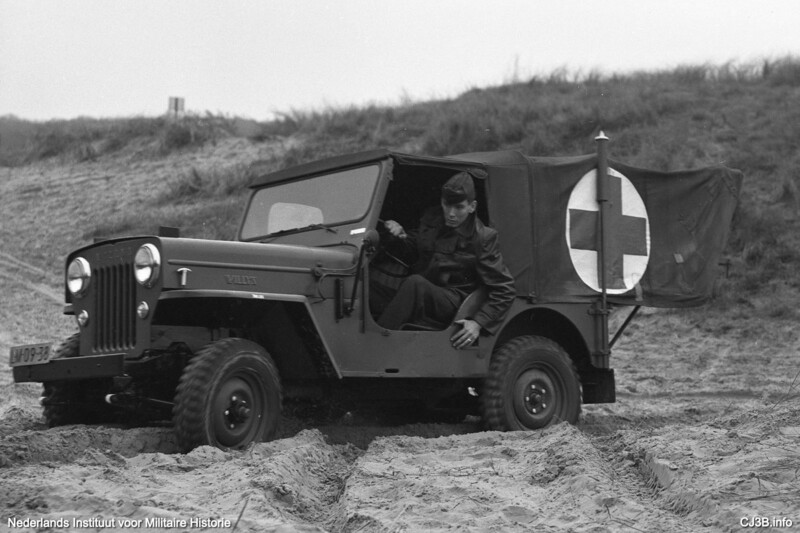 The KLu Jeeps were olive drab, and the emblem on the windshield frame was the KLu roundel in red, white and blue. 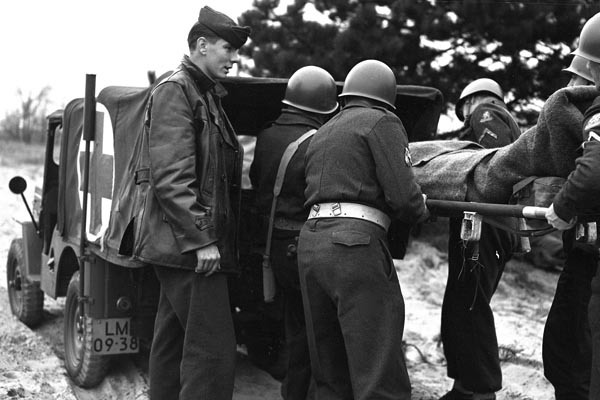 The letters "LM" on the license plate indicate LuchtMacht or "Air Force." 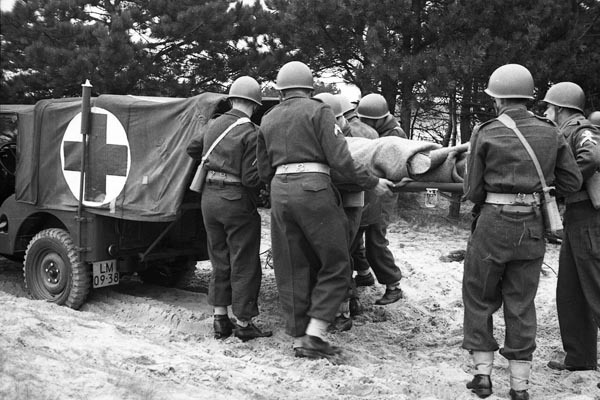 The stretcher carrier on the back of the Willys was designed by Riemvis and produced at Gebroeders Visser ("Visser Bros.") in Leeuwarden, a company specializing in ambulances. 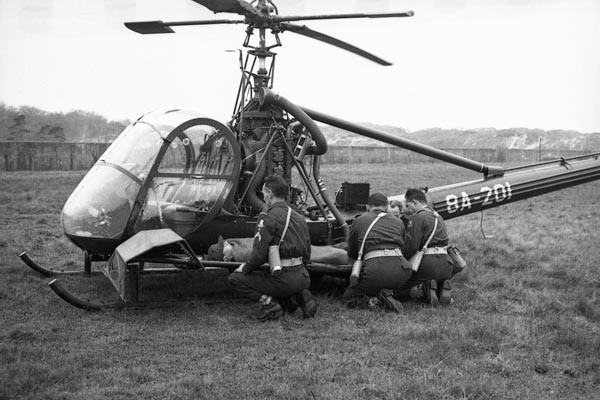 The stretchers floated on circular springs. 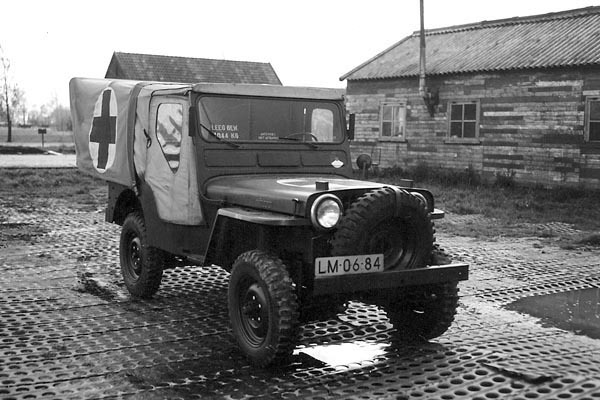 LM-06-84 seen here was the only CJ-3A which the KLu equipped with a double stretcher carrier. The same system was also used later to modify CJ-3B and M38A1 Jeeps built by NEKAF in Rotterdam (see Willys Military Ambulances). 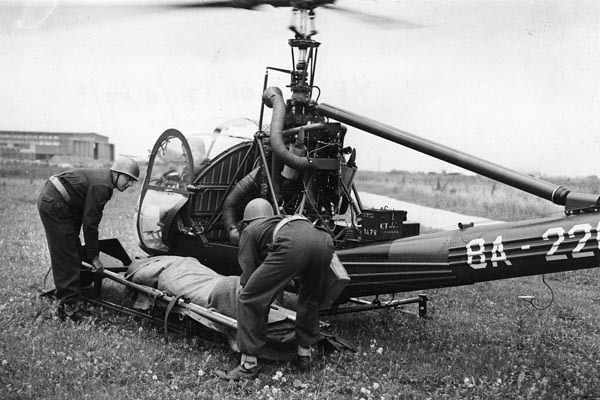 The KLu ordered 37 of the model CJ-3B in 1954 from NEKAF. Ten of these were converted into ambulances. One of the CJ-3Bs is seen here in a set of photos taken at an exercise conducted in 1958 by the Military Medical Service, the Militaire Geneeskundige Dienst (MGD). The photos are copyright Nederlands Instituut voor Militaire Historie (NIMH). 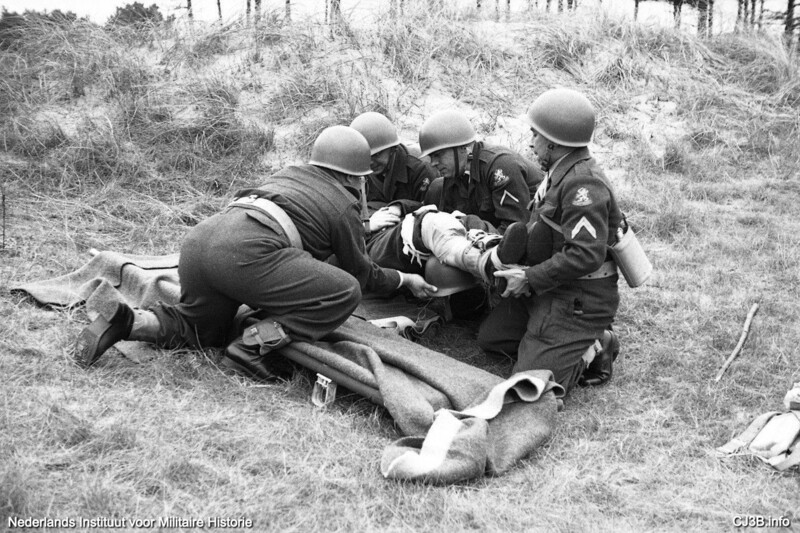 This MGD exercise staged on 26 November 1958, had ground crew dealing with simulated casualties, and working together in difficult terrain with the Willys Jeep and helicopter crews. 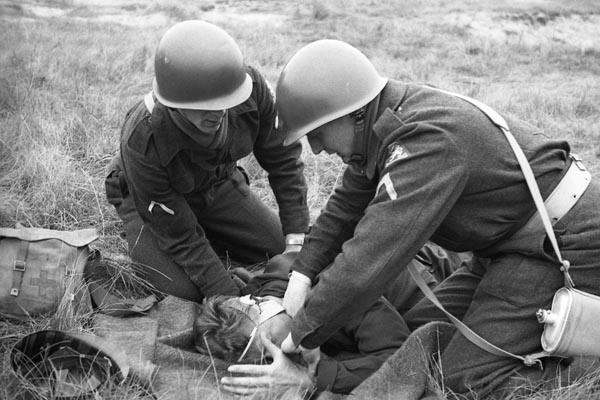 The LKu personnel are clearly practicing first aid techniques they have been learning, including the four-man lift of a casualty with feet secured together, and a helmet to elevate an injured leg. In December 1953 the Dutch Army had prepared an order for 2,000 CJ-3B Jeeps from NEKAF. 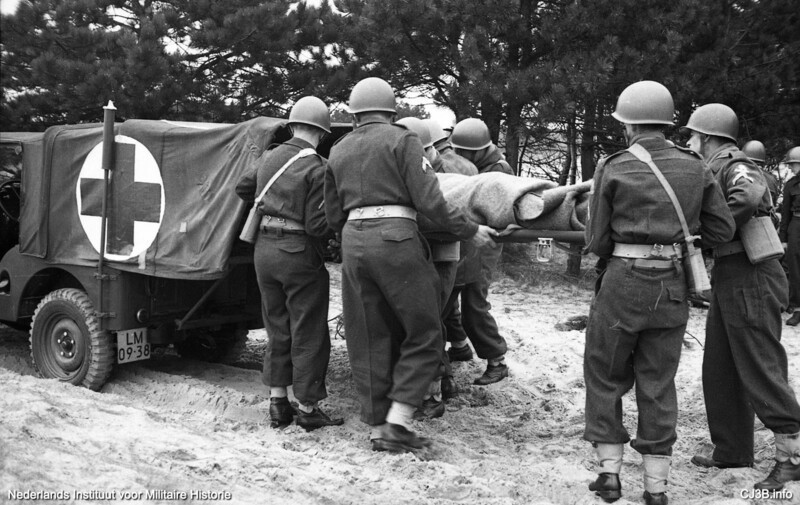 However, modification to meet NATO standards was time-consuming, and eventually the order was cancelled. 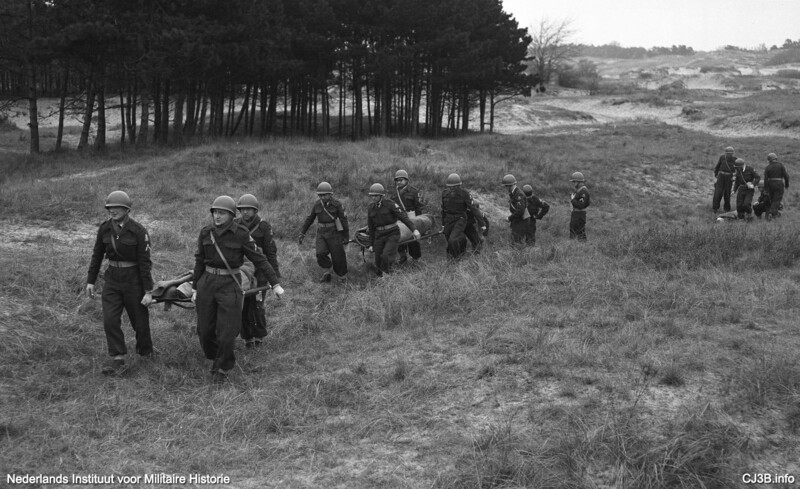 The U.S. State Department agreed in 1954 to approve assembly by NEKAF in the Netherlands of the M38A1, already approved by NATO. The M38A1 then became the primary Dutch military Jeep, so the KLu CJ-3Bs were a rarity. 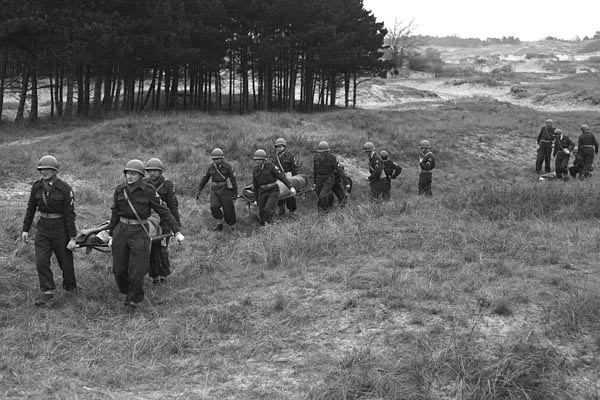 The MGD exercise took place in the dunes of the Waalsdorpervlakte in The Hague, which is also known as the area where over 250 members of the Dutch resistance were killed by the Germans during World War II. 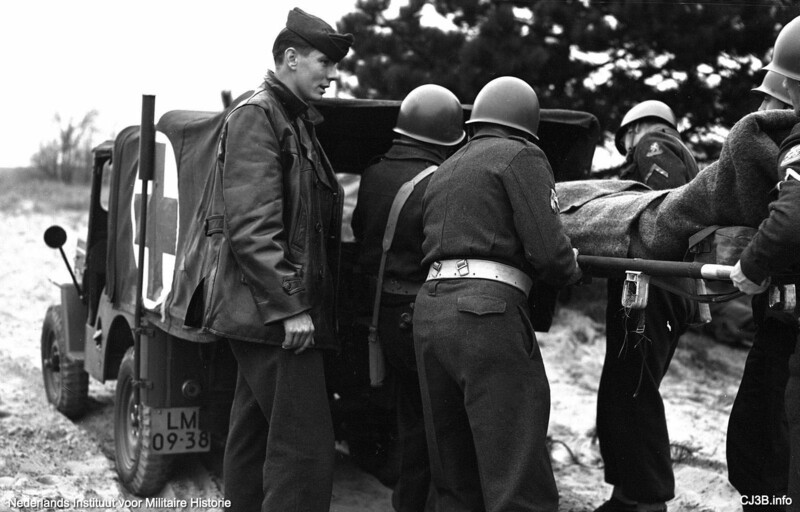 The KLu personnel load stretchers into the Jeep in this NIMH photo. The Jeep driver is the only one who really has the Air Force look, in his flight cap and leather jacket. 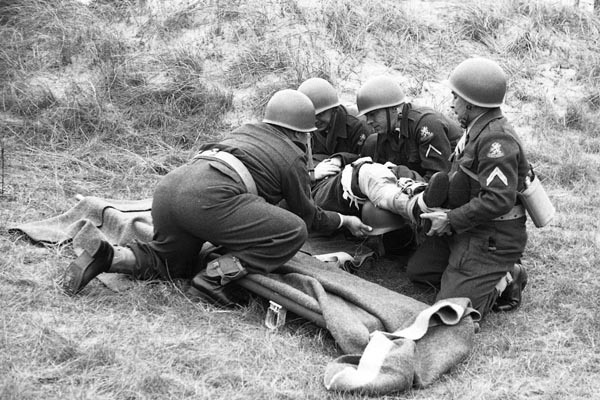 The volunteer casualties are probably thankful for the springs under the stretchers. The post attached to the left rear corner of the Jeep is a radio aerial, but the whip antenna on top is missing. At a designated location, the casualties are transferred to a Hiller Raven helicopter. The helicopter photos were taken during an earlier MGD exercise in June 1958. Copyright NIMH. The chopper brought the stretcher cases to a KLu ambulance on the tarmac at Ypenburg Air Base, near The Hague. Photo courtesy of Hans Waldeck. 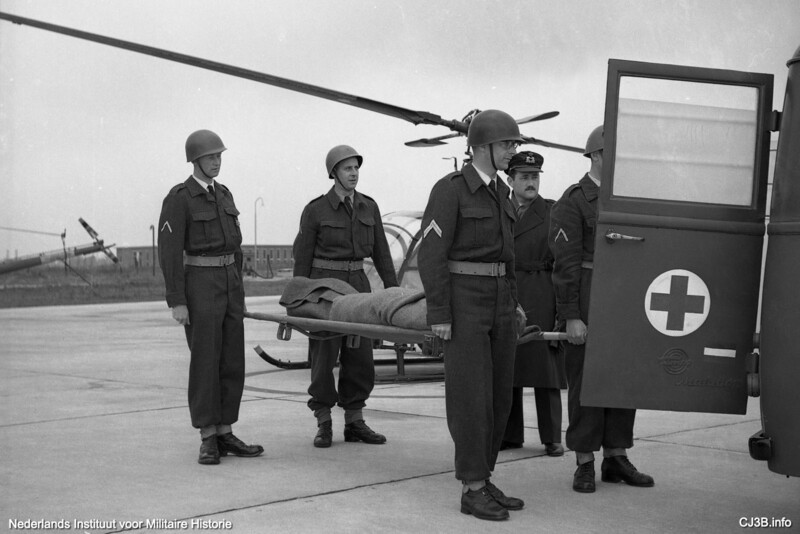 The logo on the door indicates the ambulance is a Tempo Matador, built in Germany. 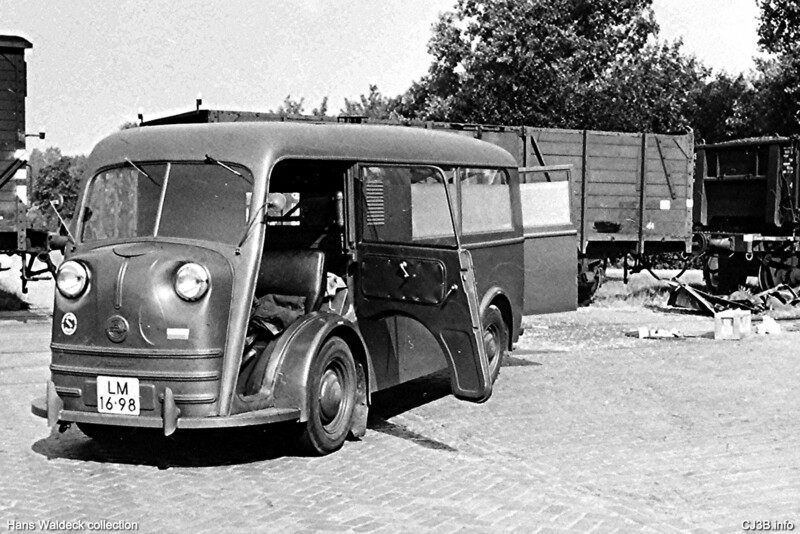 Ambulance expert Hans Waldeck provided a front view photo of a KLu Tempo Matador (320K JPEG). 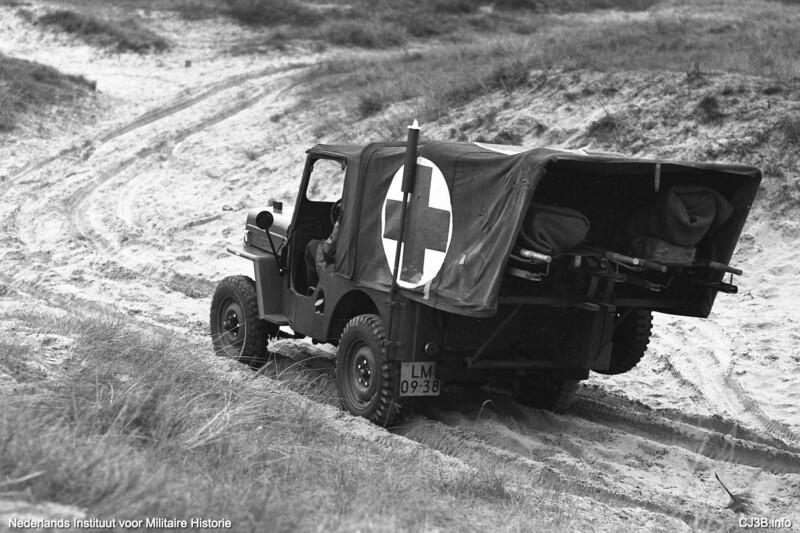 See more Willys Military Ambulances on CJ3B.info. 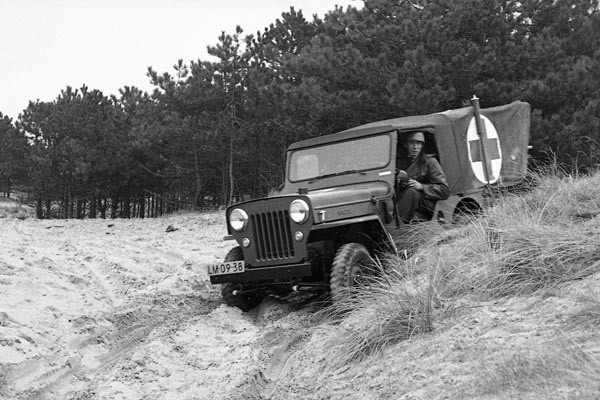 See more Jeeps in the Netherlands on CJ3B.info.